Mostly, capped landfills remind me of the mausoleums of a consumer society. For most of a century we dumped our solid waste onto these Mt Trashmores and mixed up a brew of concentrated toxins which seeped into the surrounding areas and often polluted (and still do) our water. So we learned to treat our waste as a resource, close the landfills, cap them, and leave them idle. We’re still very primitive about this, but progress is steady. There’s not much you can do on a capped landfill because it’s essential that we not disturb the protective rubber liner that is usually only 12-18” below the grass that covers it. But there are some uses. Most are relatively passive: cultivation of hay, green space, wildlife habitat, and biking/walking/running trails. Some are more active: golf courses, baseball fields, and soccer fields. 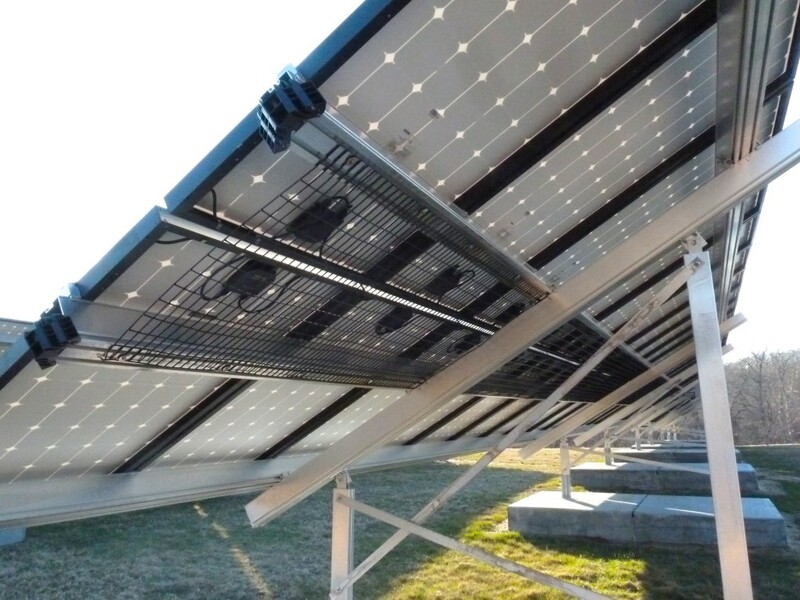 Perhaps the best (and becoming widespread) is covering the cap with solar panels. There’s poetry in this. The symbols of our wasteful practices – landfills – are becoming host properties for the promising creation of a society powered by renewables. Like parking lots, landfills are distressed properties that can now serve a valuable purpose. The small town of Aquinnah on Martha’s Vineyard capped its tiny landfill many years ago. Now it serves only as a transfer station. Residents drop their solid waste in bins and it is then transported to our Regional Refuse Station (don’t get me started about what happens after that – most of it could be composted as it is on Nantucket, but we haven’t reached that stage of semi-enlightenment yet). 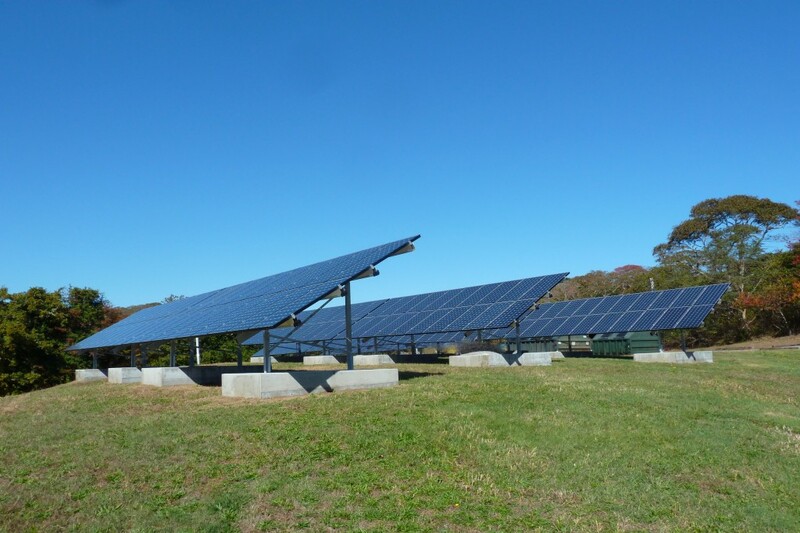 On January 23rd a ribbon-cutting was held for the new solar system at the Aquinnah Landfill that will provide all the electrical power for the town municipal buildings. 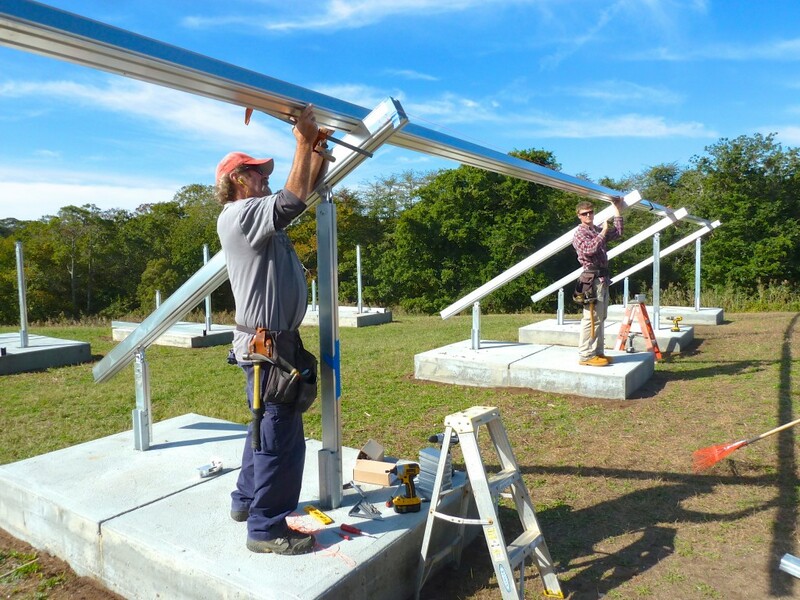 Below, SMCo co-owner and foreman Pete Ives and solar installer Hunter Cottrell are installing the racking. Landfills are fragile. The permitting is complex and the site must be carefully protected during construction. It’s good to have one under our belt. We’re ready for more – bring ‘em on. Chilmark sounds good, and West Tisbury and Edgartown and . . . maybe Nantucket too! !